Energy Efficient Lighting and Appliances Appliances and lighting represent a significant proportion of energy consumption in the typical household. Appropriate choices of appliances and lighting can cost effectively reduce the amount of energy con- A large number of electric lighting options are available, but these vary considerably in their energy efficiency. Fluorescent lighting is preferred where lighting will be used extensively. Compact fluorescent and energy saving fluorescent lamps are the most efficient alternatives. Natural light and passive solar heating are entirely compatible, arid represent cost-effective means of reducing energy consumption. Having made appropriate choices for appliances and lighting, recognize that the cleaning and maintenance of appliances, light fixtures and windows are important factors in realizing the full potential of these investments in energy efficiency. Excessive areas of glazing should be avoided, as much more heat is lost through windows than through an equivalent area of insulated wall. Generally, a total glass area of about 12 percent of the floor area of the house is adequate. On the other hand, energy-efficient windows with unshaded southern exposure can contribute positively to the heating of the house, especially when combined with heavy drapes or insulated shutters that can be closed on cloudy days and at night. For thermal insulation, new high performance windows are available in most locations in Canada. Insulating glass units made of spaced sheets of glass are available for insertion in window sashes or frames. These windows with multiple glazings, selective coating and charged with argon or krypton can significantly reduce energy costs. Condensation, a common homeowner complaint, can be reduced by installing good, energy efficient windows. Some condensation on windows is normal and should be expected, particularly around the edges of the glazing during cold weather. Nonetheless, multi-pane windows with thermally broken frames and good quality spacers can go a long way towards reducing the likelihood of condensation in today's houses. However, wood doors have proven performance and a traditional appearance which has maintained their popularity in the marketplace. Irrespective of the style and appearance of the door, a number of common considerations are worth noting. In the past, due to low energy prices, it was not common to completely fill wall stud spaces with insulation, or to insulate attics to a depth greater than that of the truss bottom chords or ceiling joists. Neither was it common to insulate foundation walls. Now, however, higher energy prices and our increasing realization of the need for energy conservation make it apparent that insulation should at least fill all available cavities within the building shell and that perhaps the shell construction should be altered to accommodate even more insulation. It has also become more apparent that uninsulated foundation walls are a major source of heat loss. 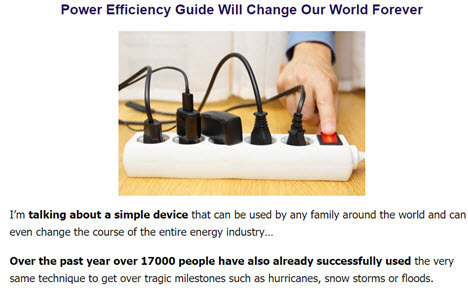 Free versions of Power Efficiency Guide can not be found anywhere on the net.